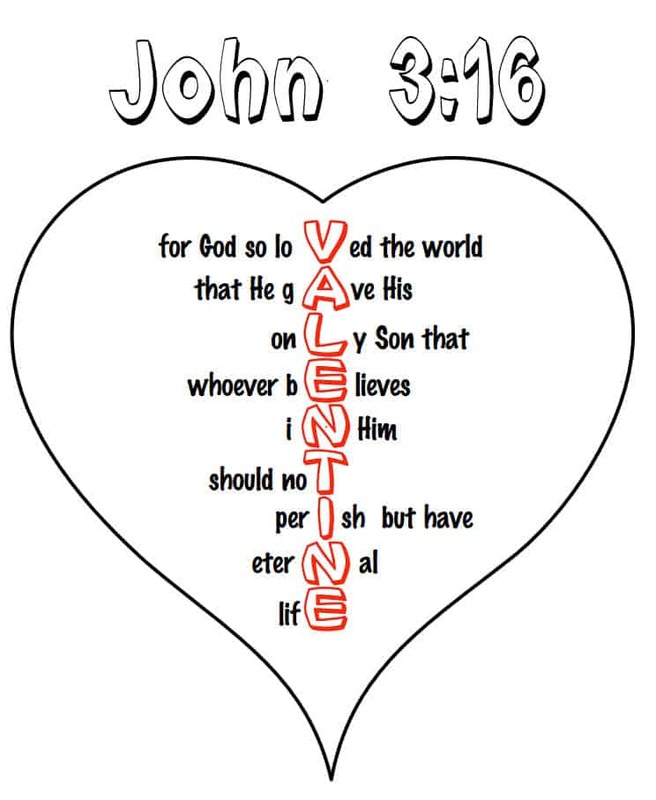 If you’re looking for Christian ideas for Valentine’s day, this John 3:16 valentine printable should help. Use it for crafts in your Sunday School or children’s church. We first posted it for Valentine’s Day, but you could also use it on March 3-16 for John 316 day. It has the text of John 3:16 in a heart shape. The letters in the Bible verse are aligned to show the word “Valentine” down the center of the heart. This coloring craft could also be used at home, in Sunday School, or in a Christian preschool class. Use this free coloring page to help your kids celebrate John 3:16 Day. Directions: To print this Bible coloring page, click on the image or the link below to download as a PDF file. A reader has also submitted a version of this coloring sheet. Here are the links. We’ve added two new Valentine’s Day coloring sheets with a similar theme. They show how Jesus is God’s gift of love to this world and include the John 3:16 Bible reference. Optional Valentine Craft Idea: Instead of using the coloring sheet, make your own. For this simple activity, you will need heart shaped construction paper and dark writing utensils (markers, crayons, pens). All you need to do is have the kids write the word “Valentine” vertically just right of the center of the heart and then fill in the words below. You will end up writing out John 3:16. You may want to write “Valentine” yourself on the hearts if you have time. — Leave a comment or star rating on this post to encourage our writers. — Take our reader survey. — Submit your ideas to share with other readers. Copyright © 2007-2019 Ministry-to-Children. Please use our curriculum material for any ministry purpose that brings honor to Jesus. We never charge or ask for donations. You can freely license our content under a Creative Commons Attribution-ShareAlike 4.0 International. That means no permission is needed as long as you credit this website in the final work. Tony Kummer (Editor) reviewed & updated this page on : January 28, 2019 at 10:42 am. All our content is peer reviewed by our readers, simply leave a comment on any post suggest an update.